Heat oven to 375°F. In 12-inch skillet, heat oil over medium-high heat until hot; cook onions in oil 15 to 20 minutes, stirring frequently, until onions are soft and golden brown. If onions start to stick, stir in 1/4 cup water. Meanwhile, in small bowl, mix mayonnaise and horseradish. Slice sheet of dinner rolls in half horizontally; place bottom half in ungreased 13x9-inch (3-quart) baking dish. Spread cut side of roll top with horseradish mayonnaise. Mound roast beef on each roll bottom. Spoon caramelized onions over beef; top with Swiss cheese. Place top half of rolls over cheese. In small bowl, stir melted butter and parsley until well mixed. Brush over top of rolls. Bake 19 to 22 minutes or until rolls are golden brown and cheese is melted. Cut into individual sliders, and serve. One cup of shredded Swiss cheese can be substituted for sliced cheese in this recipe. King’s Hawaiian™ savory butter rolls (12-oz package) are the perfect choice for this recipe. 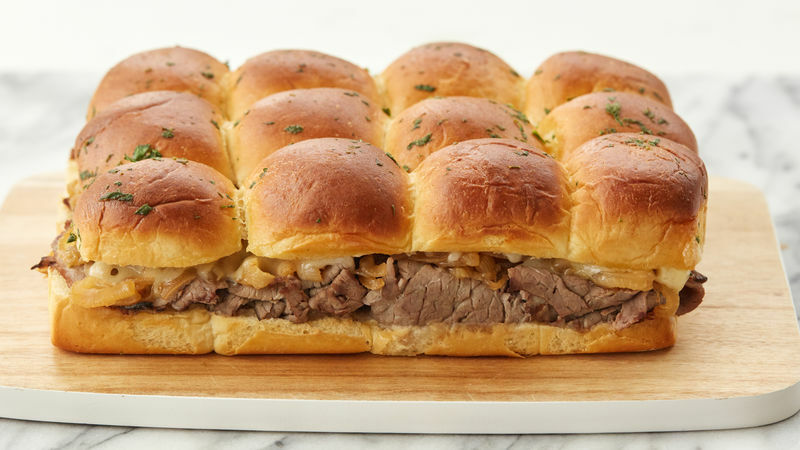 As far as party food goes, these roast beef sliders are everything. They’re easy to make, bake beautifully in the oven and can feed a hungry crowd. While it may seem like extra work to first caramelize the onions, they provide a lot of rich, sweetness that matches perfectly with the roast beef, so don’t skip this step! Using a whole sheet of dinner rolls is the easiest way to create a lot of mini sandwiches very quickly that are easy to serve. Just let your guests break off what they want and enjoy. And while any 12-count package of dinner rolls can work, for extra deliciousness King’s Hawaiian™ savory butter rolls work the best with this recipe. So beef up your party food and make these mouthwatering sliders for your next game day, party, potluck or easy weeknight meal.